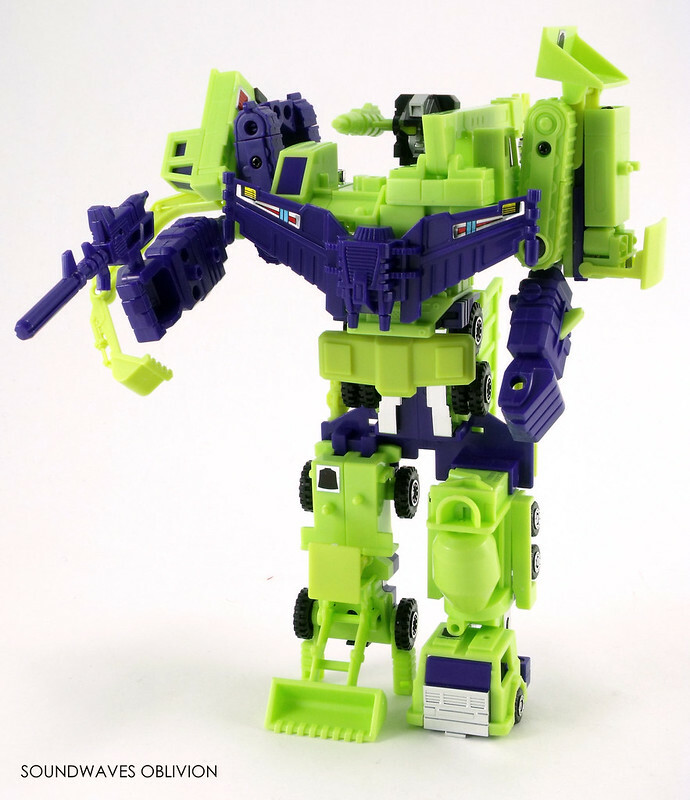 The 2018 Walmart reissue Devastator is a much welcome release, a mould which has not released by Hasbro since 1992 under the Generation 2 series. 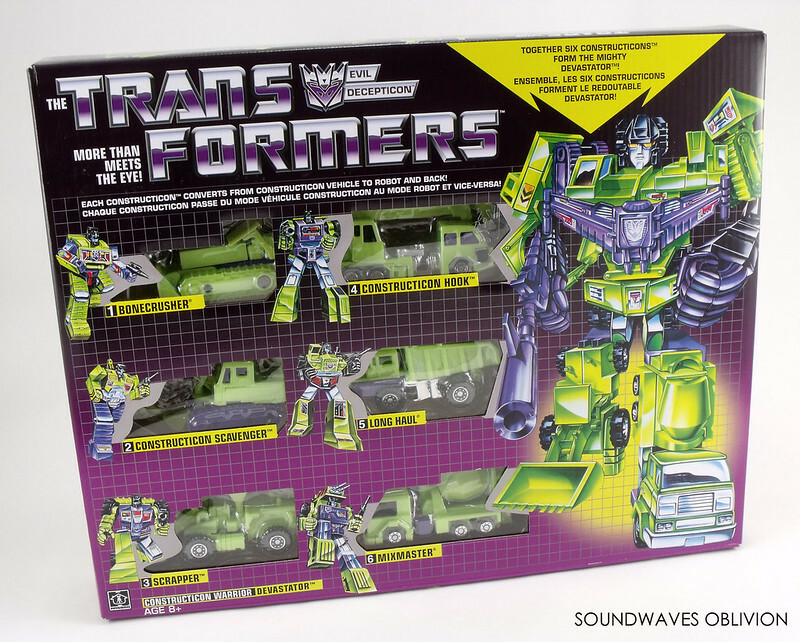 More likely chosen as a release to follow the 2015 Combiner Wars update, the Walmart reissue closely resembles the original 1985 giftset down to the 1980's Hasbro logo. 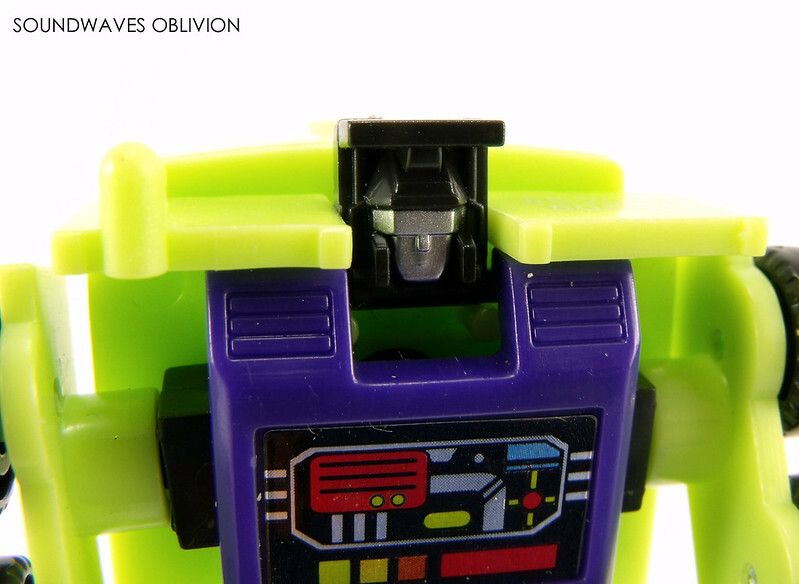 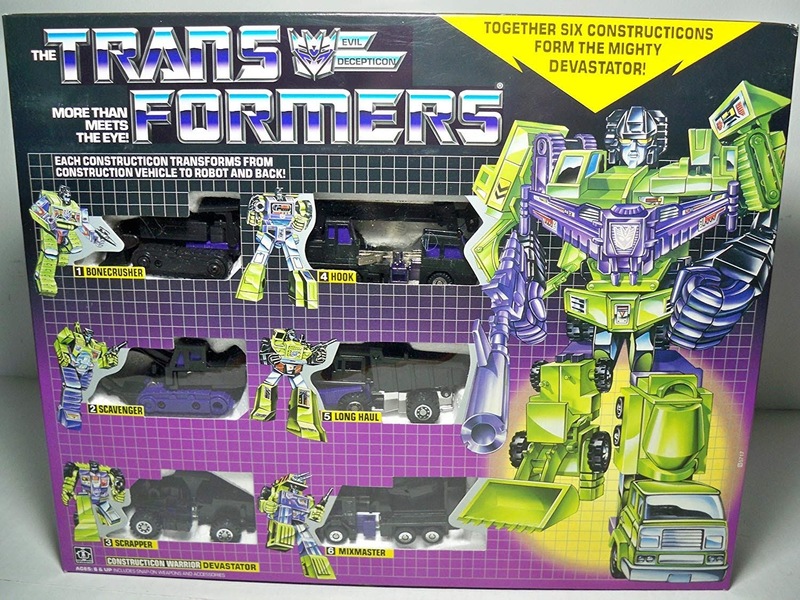 One of the notable differences on the front of the box are the "Constructicon" prefix before Hook and Scavenger. 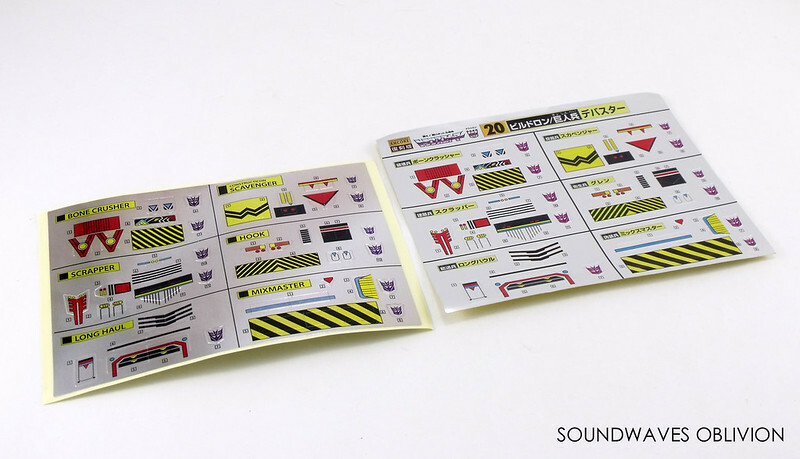 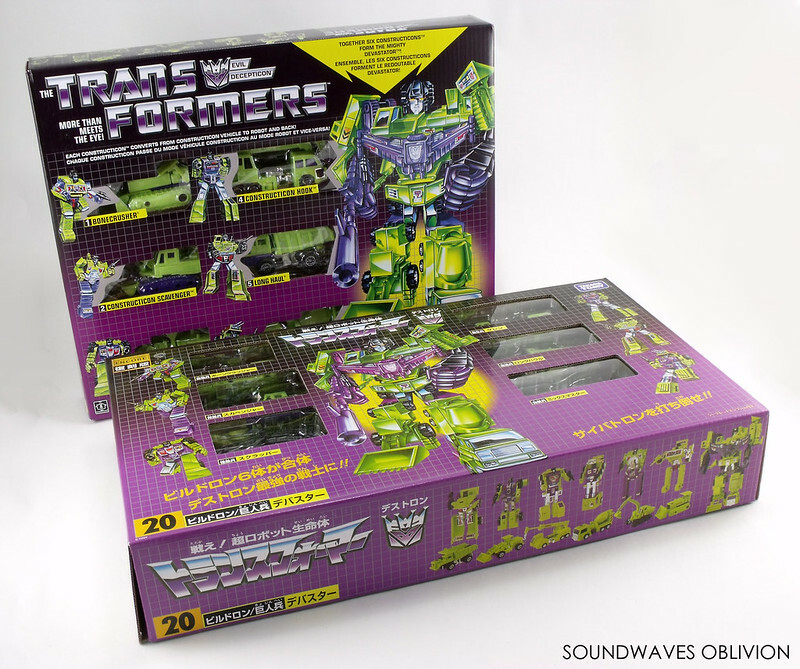 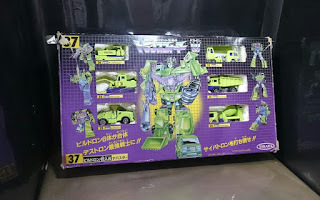 Inside the box the toys themselves are noticeably different from the original 1985 versions; this is because they use the new moulds created for Takara Tomy's 2011 Transformers Encore Devastar (Devastator) giftset. 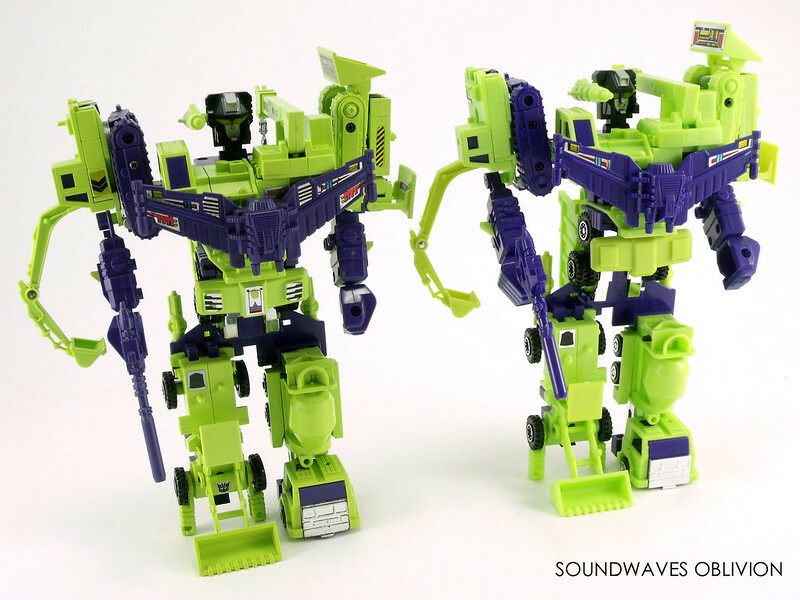 The figures themselves are bright green in colour similar to the 1991 El Greco version released in Greece. 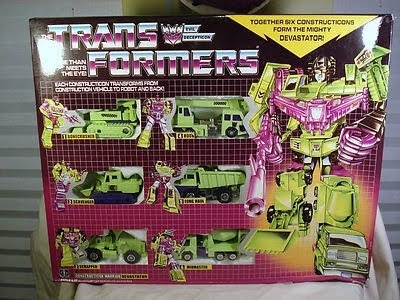 When initially combined you will notice Devastator hunching forward, luckily this is easily remedied. 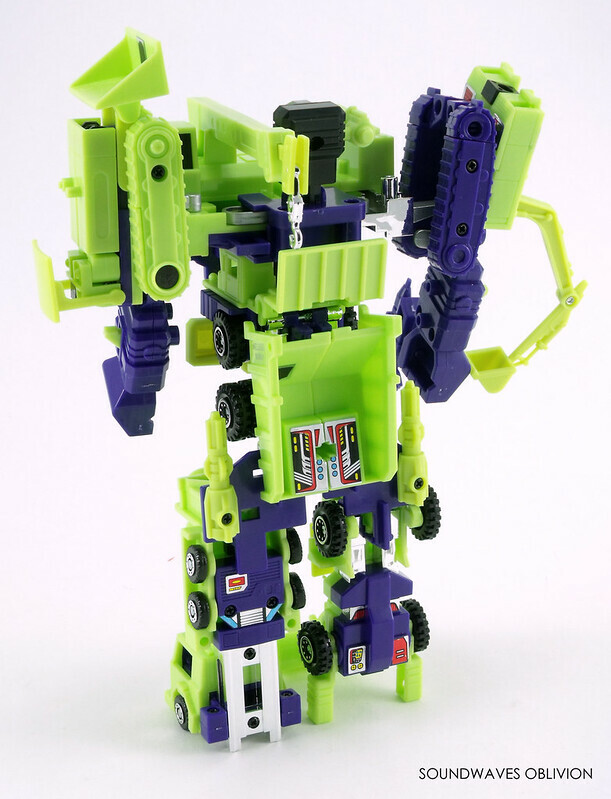 By raising the chest you can get Devastator to stand up straight. 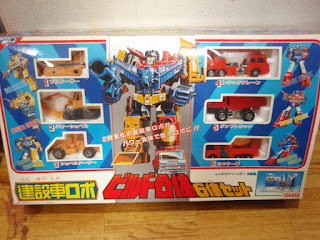 In 2013 Takara Tomy released an anime redeco under the Encore line which as well as featuring new colours it had a cartoon styled head for Devastar; unfortunately Long Haul already had mould deterioration in this set so when combined into Devastar, he looks hunched over. 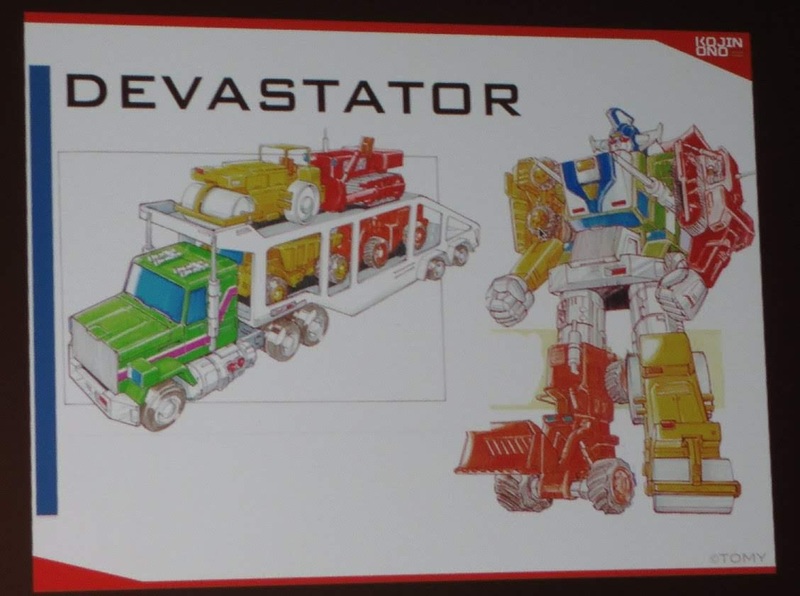 This is easily fixed by not folding Long Haul's front section completely forward. 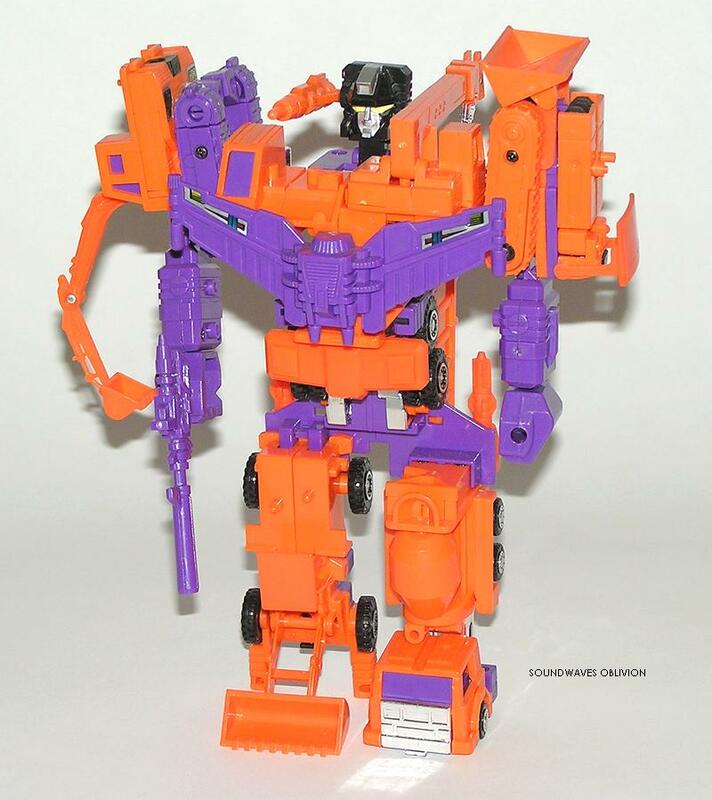 Unfortunately Hasbro have used this version of the mould for the 2018 release which isn't too bad considering it is easily remedied. 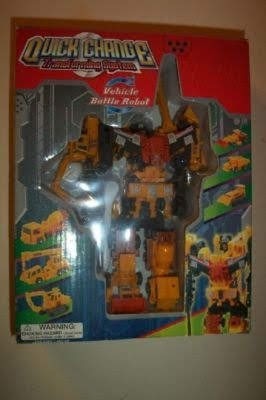 The new anime styled head however was not used for this release unlike the Walmart Bumblebee reissue. 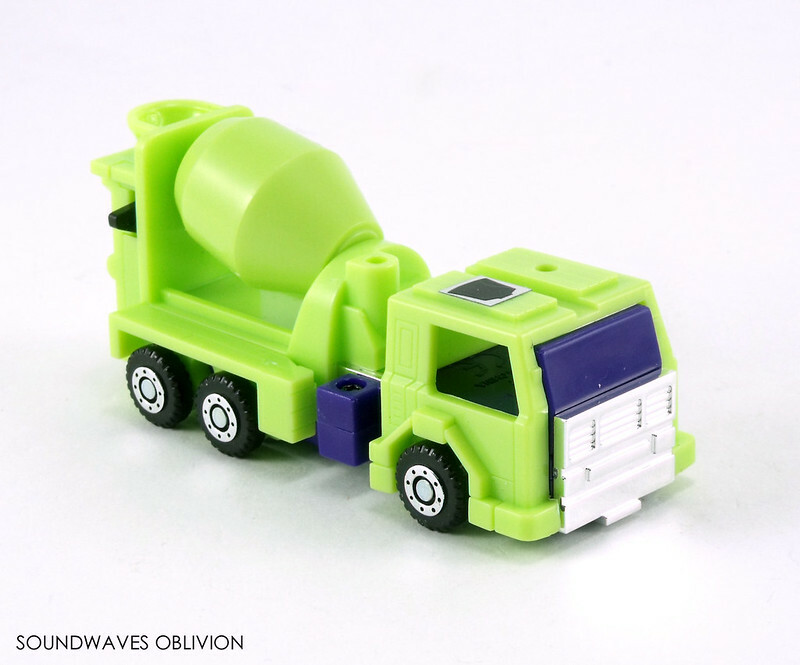 Another issue with this 2018 release although this may just be my version, was that Mixmaster's arms were glued in place and it took a lot of prising to separate them from the body, leaving a dried glue residue on Mixmaster's arms and body. 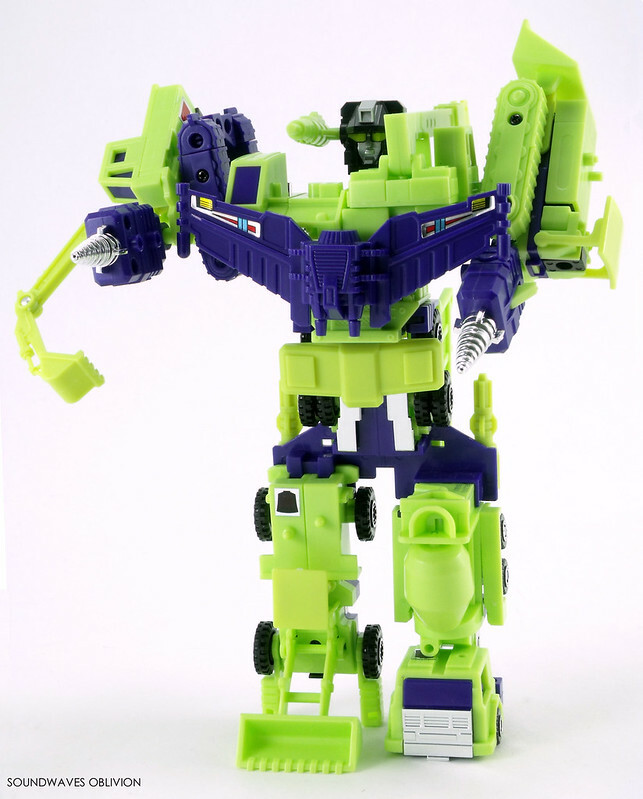 Devastator is bright green in colour and some sections of the green plastic do not match like Bonecrusher's & Scrapper's cab cover, Scavengers excavator arm, Hooks Crane. 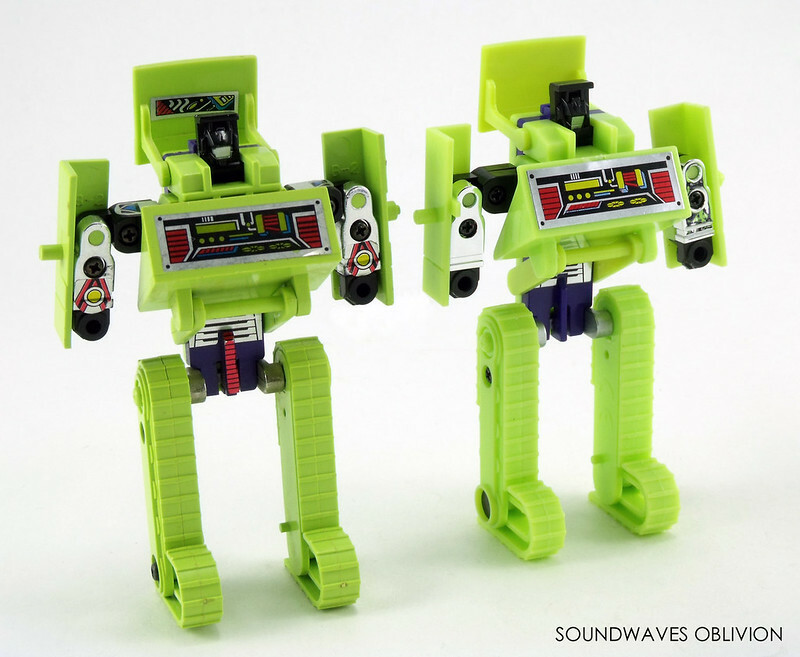 The green coloured plastic did not match on Takara Tomys Encore version either but they did match on the original 1985 version. 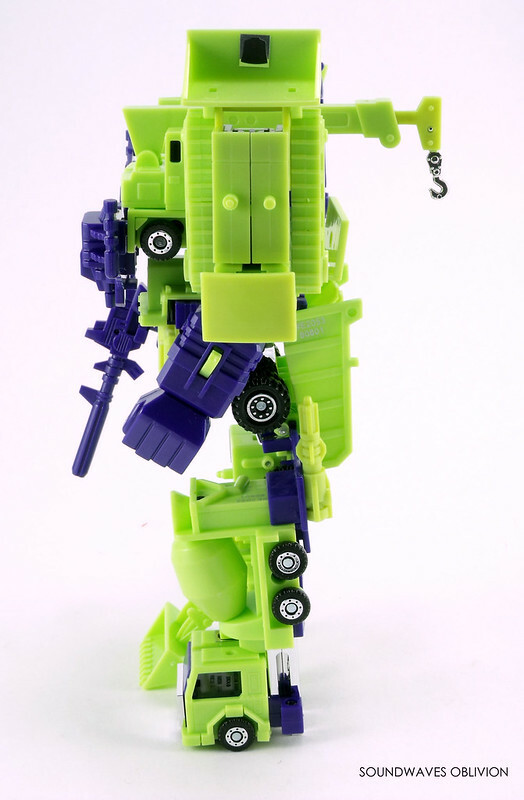 Bonecrusher Transforms into a Bulldozer, the main two differences are Devastators forearm piece has had the spring launcher removed and the screw on Bonecrushers leg buy his ankles have been replaced with a pin. 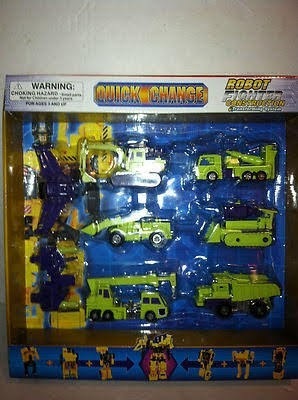 Note the loss in definition with Hooks face. 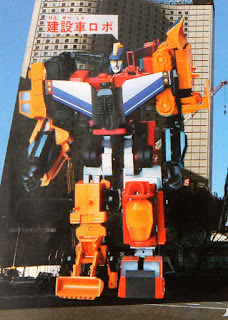 This was also present in the 2011 Encore version. 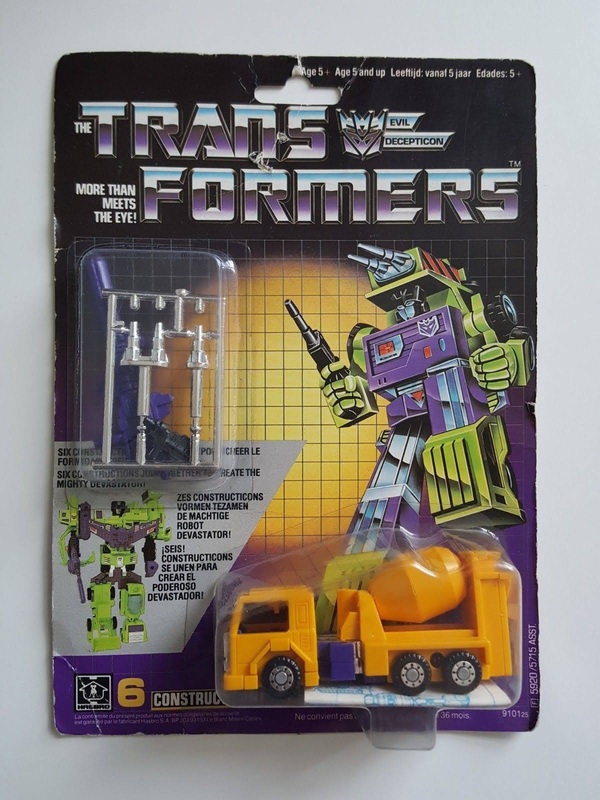 Hook transforms into a crane; the die cast metal connector separating the body and legs now has pins instead of screws to secure it, there is a loss of definition in the face, specifically it looks like his mouth has vanished (this is also apparent in the Encore version). 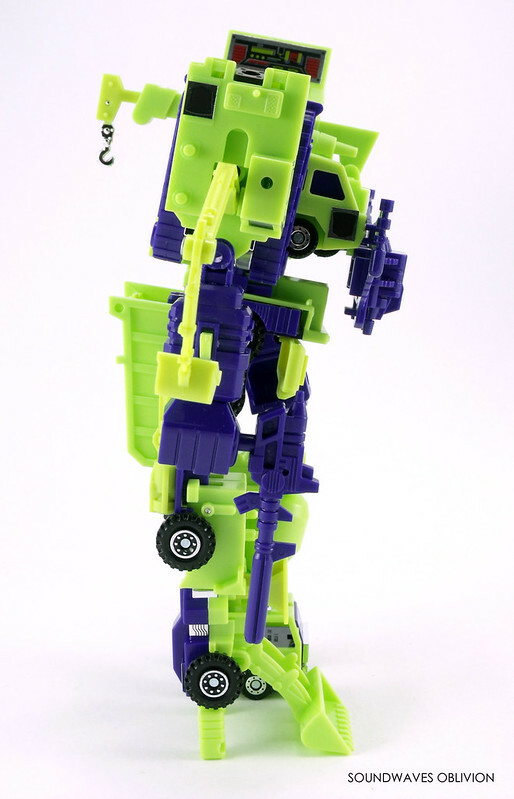 Like the updated Encore version this features a new tab moulded on the leg which better secures Hook together when formed into Devastators chest and Hooks "hook" now faces the opposite direction. 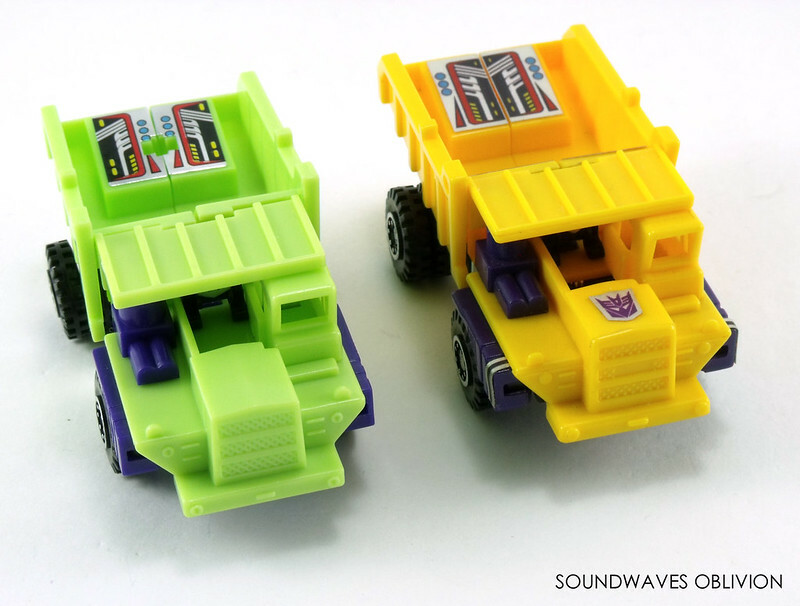 The hole in the front grill blanked out on the yellow 1992 European release. 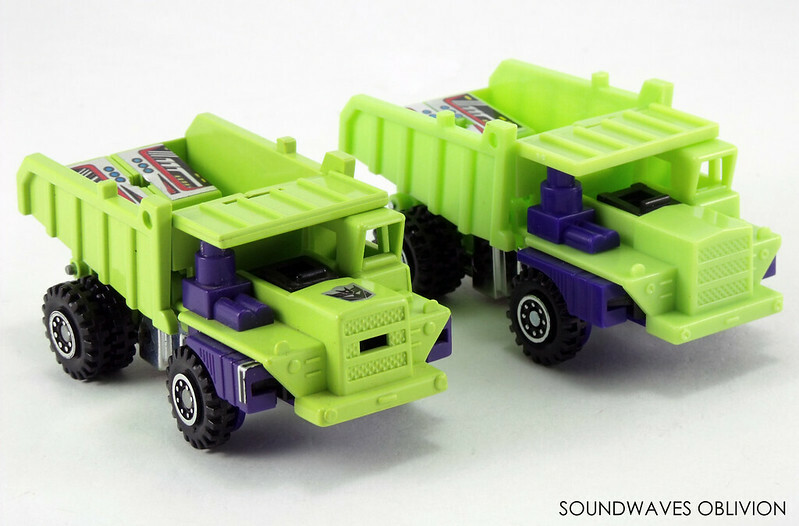 Long Haul transforms into a dump truck; the main difference is the grill has been remoulded as a solid piece, the G1 version had a hole (this was used to plug the chest piece in on the original Diaclone version), this was blanked out for the 1991 El Greco release and the 1992 Euro & G2 versions. 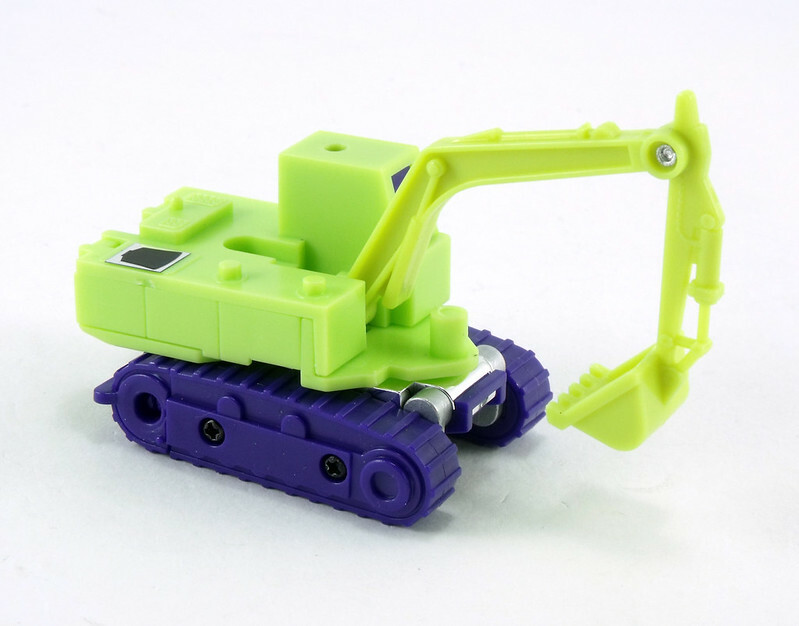 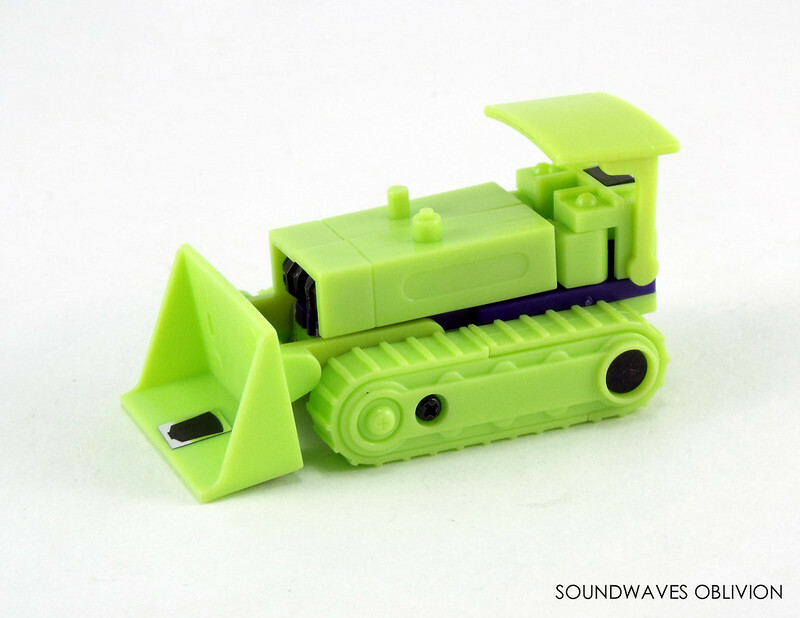 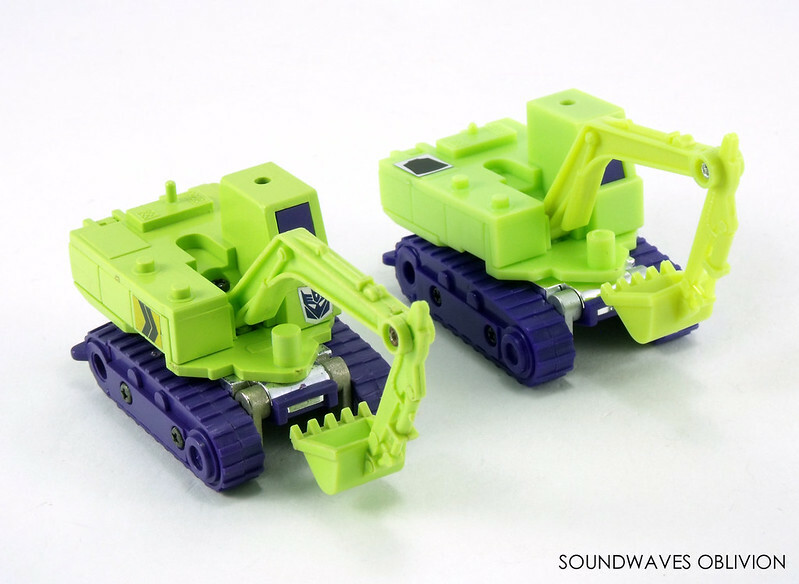 The missile mount / Devastators leg connectors have been remoulded to add strength to the plastic connectors when combined with Scrapper and Mixmaster. 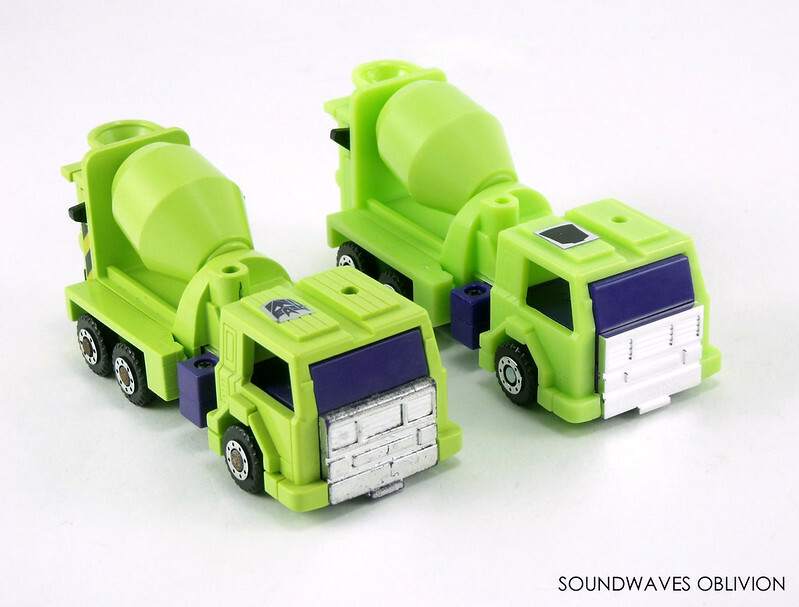 Mixmaster transforms into a Cement Mixer truck; other than the spring function being removed there are no specific differences. 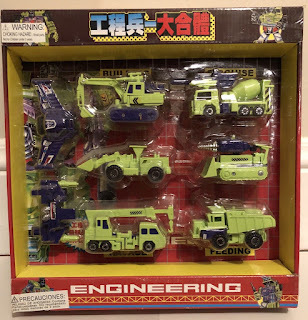 The rub sign has now been placed on the cab rather than the top oh his head which is an improvement seeing as the old placements of the rub signs were always damaged by Devastators leg connection. 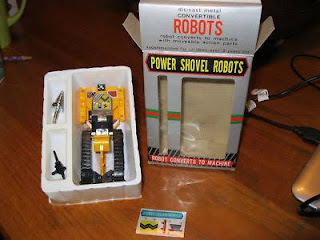 Scavenger transforms into Power Shovel Tracked Excavator, the main difference compared with the G1 version is the exhaust is shorter. 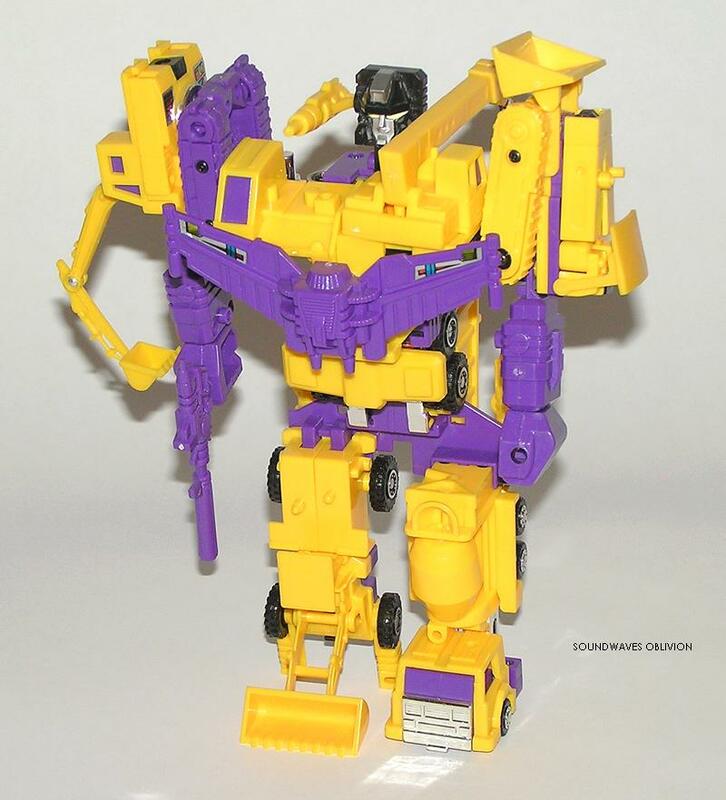 The spring has also been removed from the wrist. Scrapper transforms into a Payloader, there are no major differences between this version and the original G1 version. 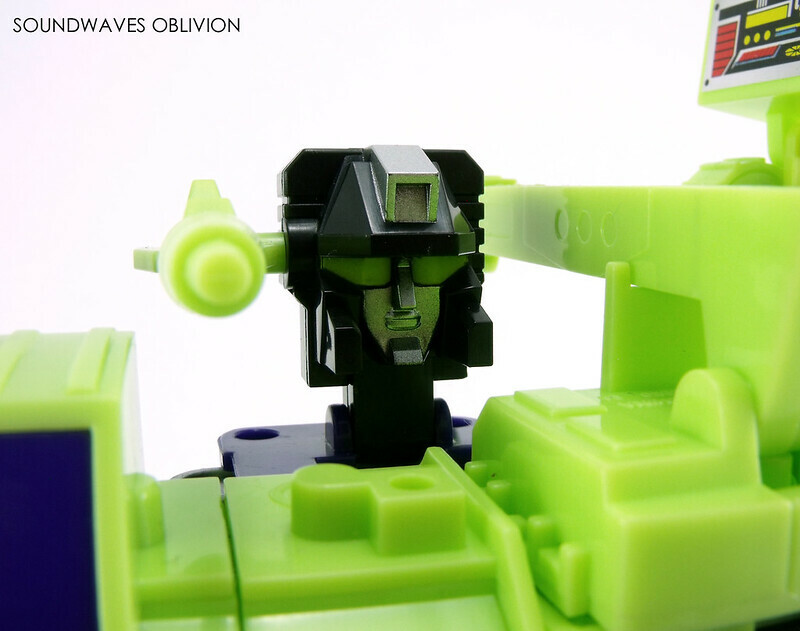 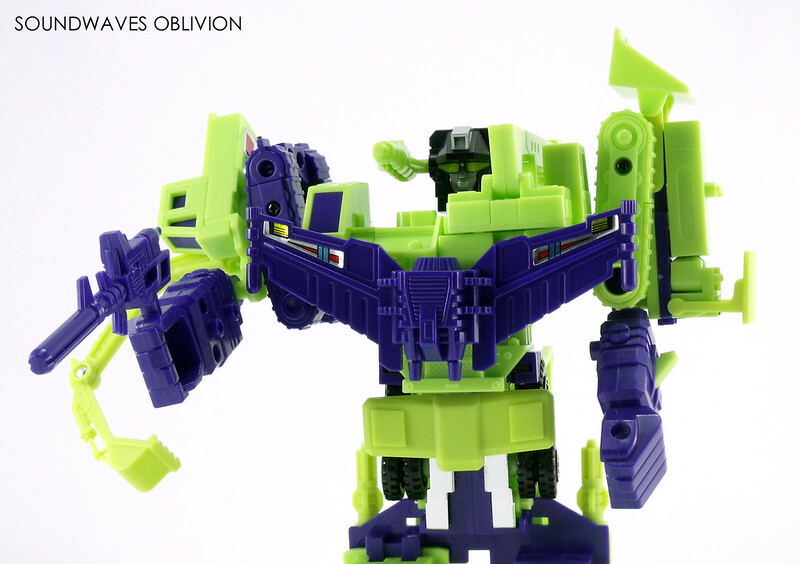 View the full gallery of 2018 reissue Devastator here on Flickr. 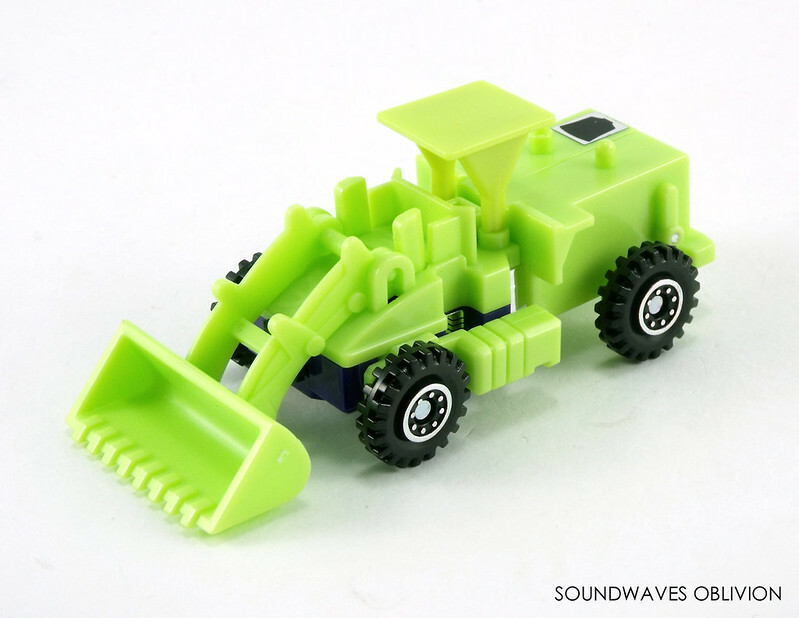 The Construction Vehicle Robo was initially designed and released in Takara's Diaclone toy-line. 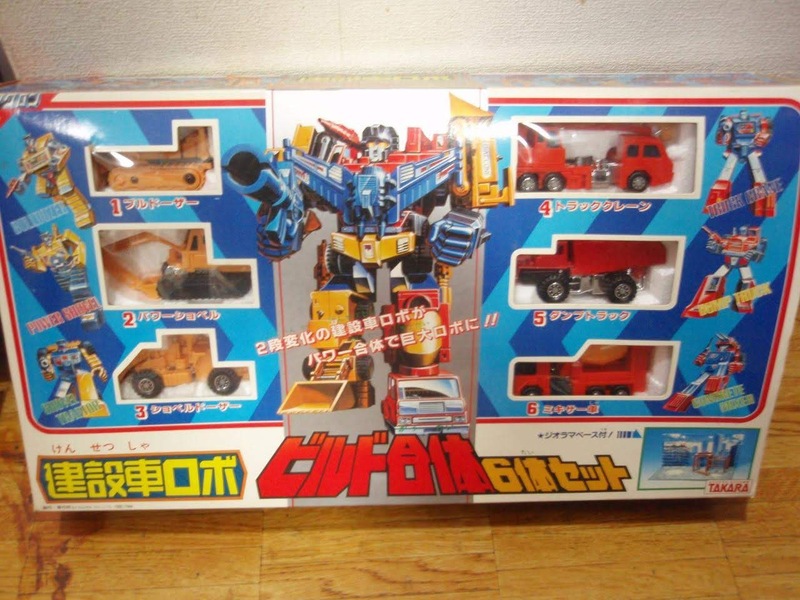 The toy designed by Kōjin Ōno was initially 5 vehicles, the larger vehicle transformed into a tractor trailer which transported the other 4 construction vehicles. 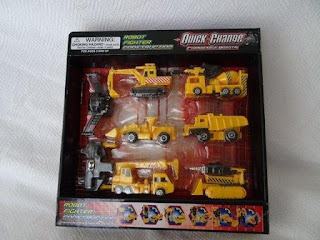 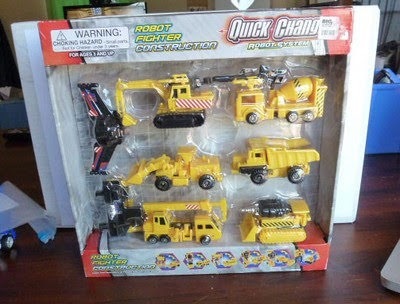 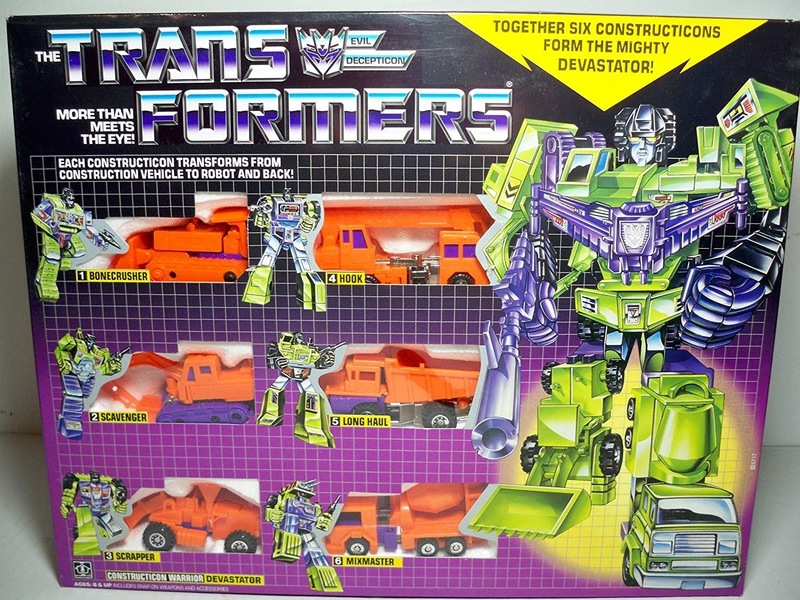 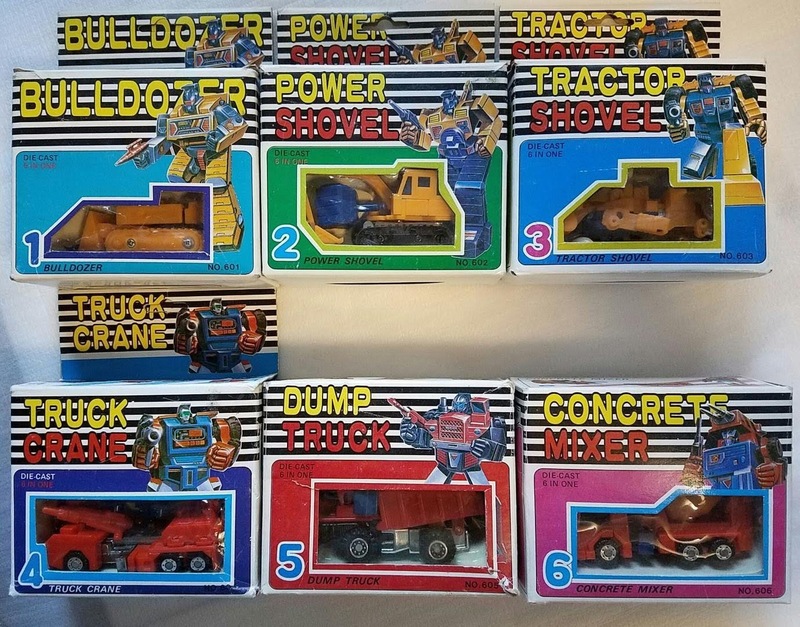 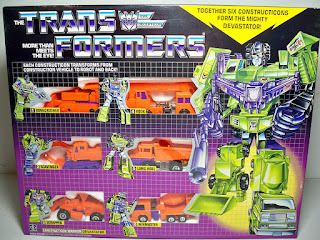 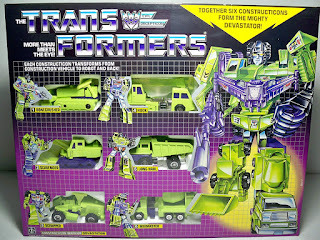 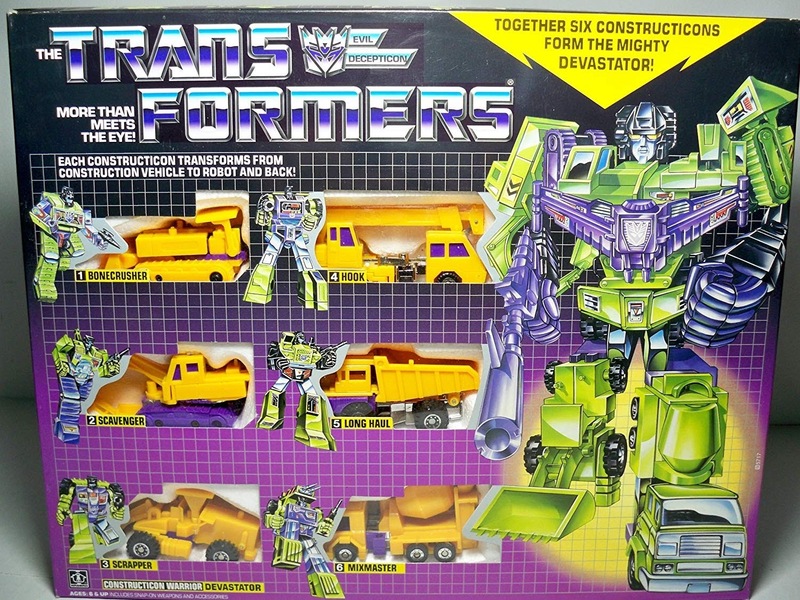 This was later changed into the familiar 6 construction vehicles and the individual robots were released in April 1984, the giftset was released later in June. 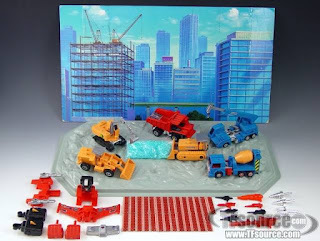 The giftset came with a cardboard skyscraper diorama background, cardboard punch-out construction beams and a plastic tray moulded like a construction site and blue plastic granules. 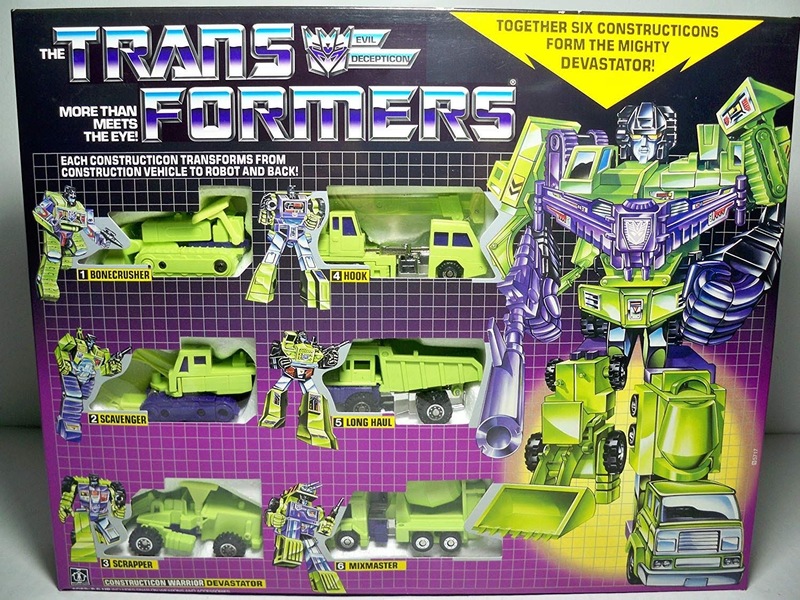 The figures in this set were also released individually. 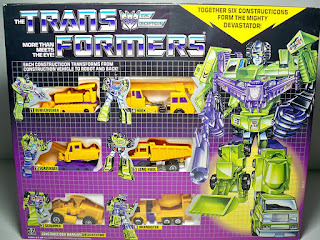 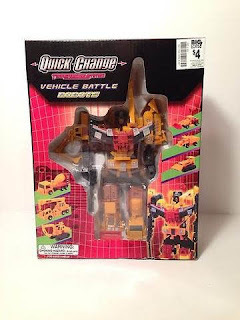 The Construction Vehicle Robo was the second combiner released in Takara's Diaclone series in 1984, the first being the Train Robo (Raiden) which was released a year earlier in 1984. 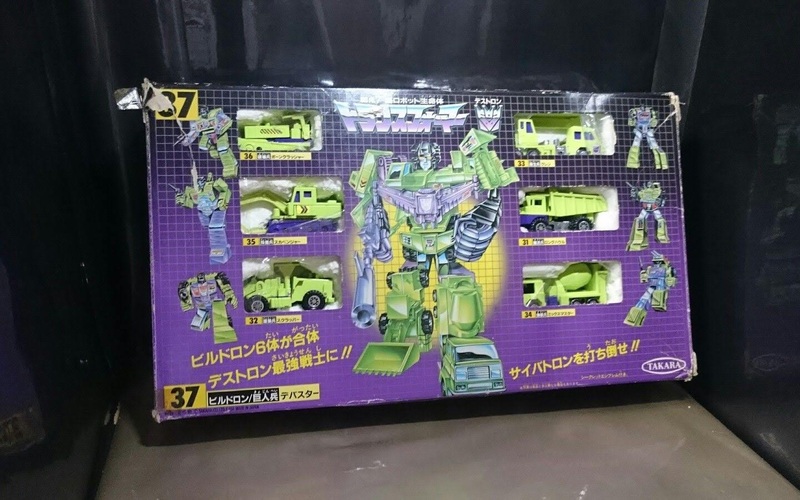 The giftset saw two colour variations and the figures were also released individually but the individual releases were only released in one colour. 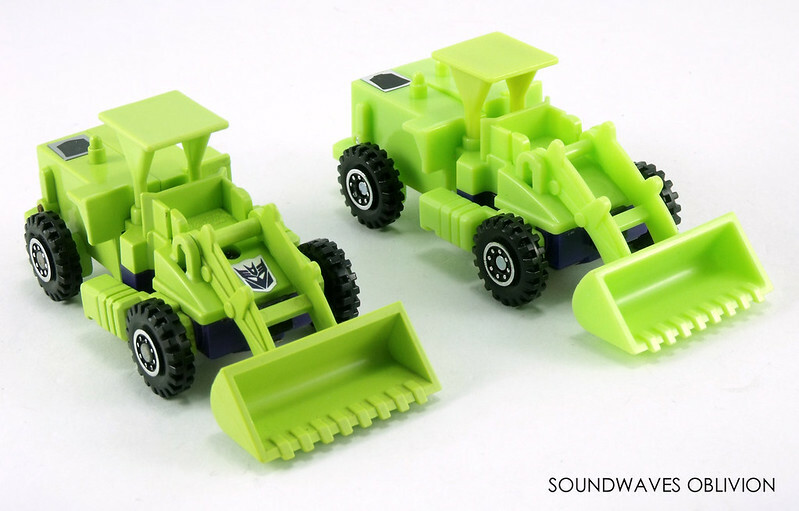 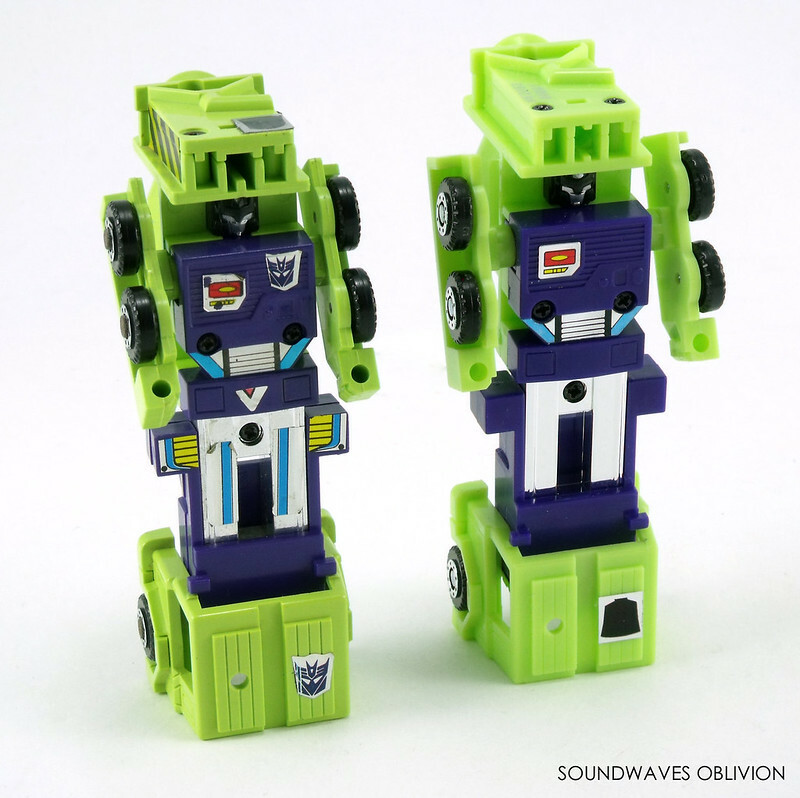 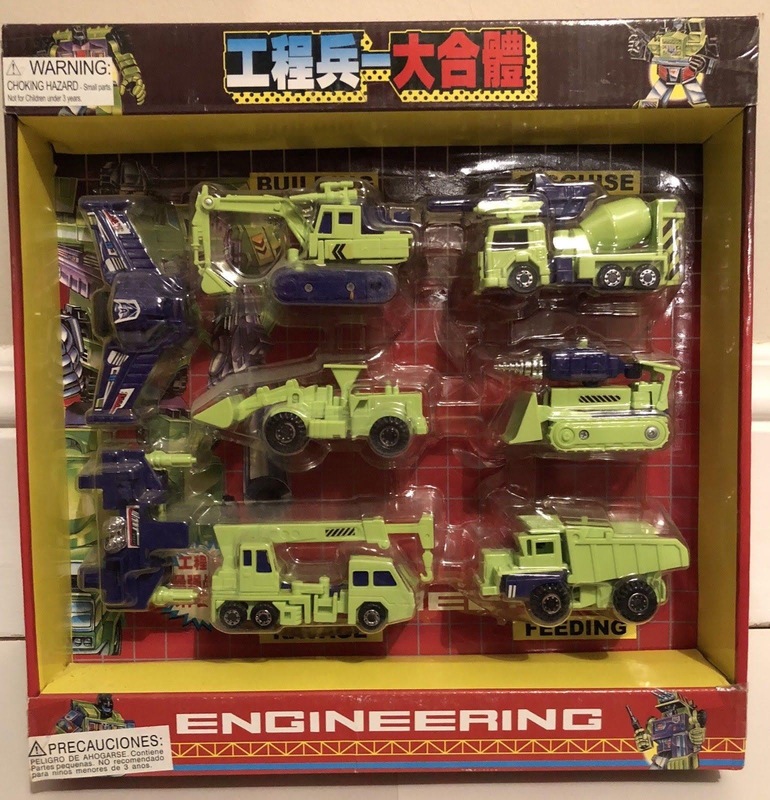 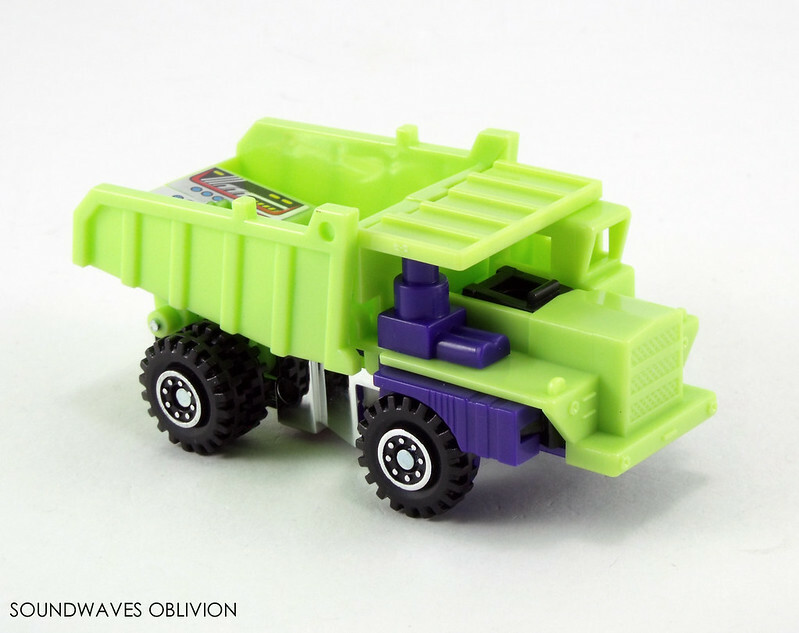 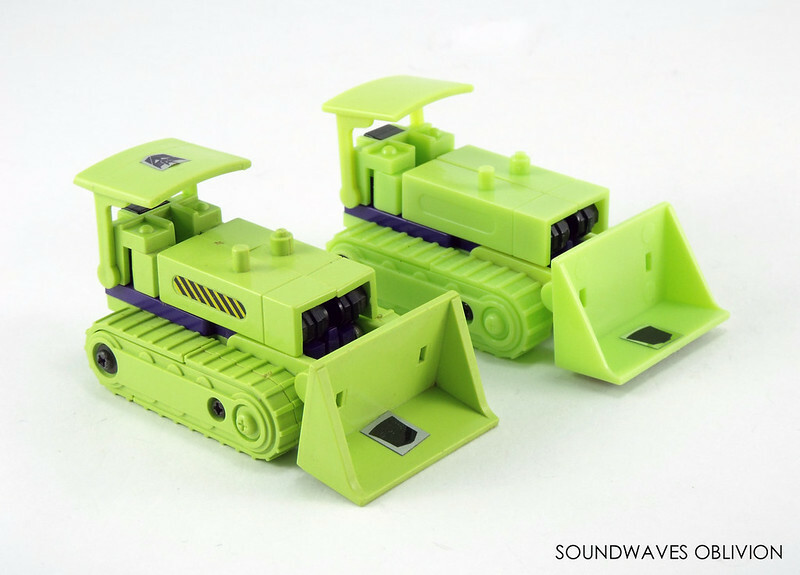 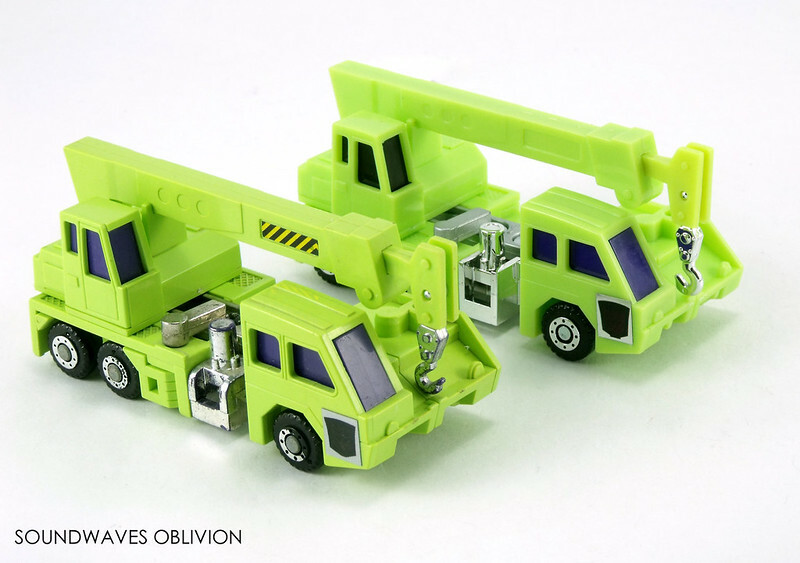 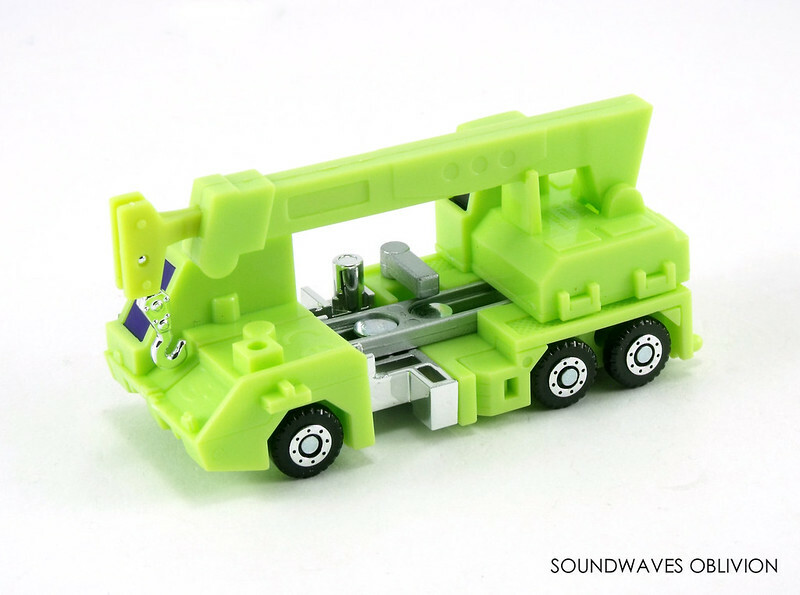 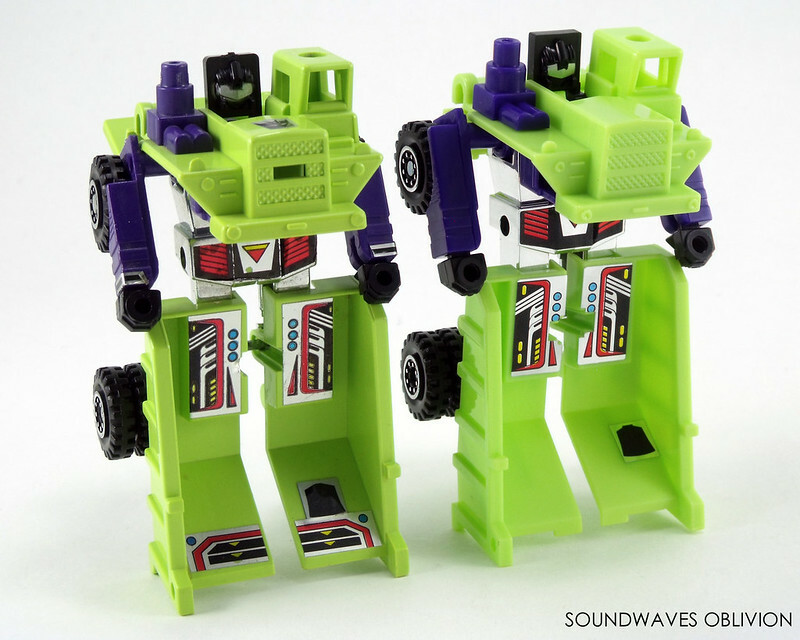 Hasbro recoloured the Diaclone construction vehicles green and purple. They were released in a giftset and were also released individually on cards. 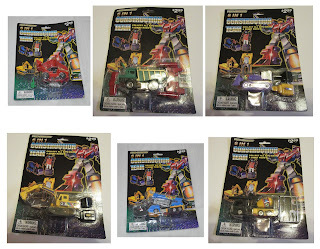 Like Hasbro Takara released a giftset and also released the individual figures in boxes. 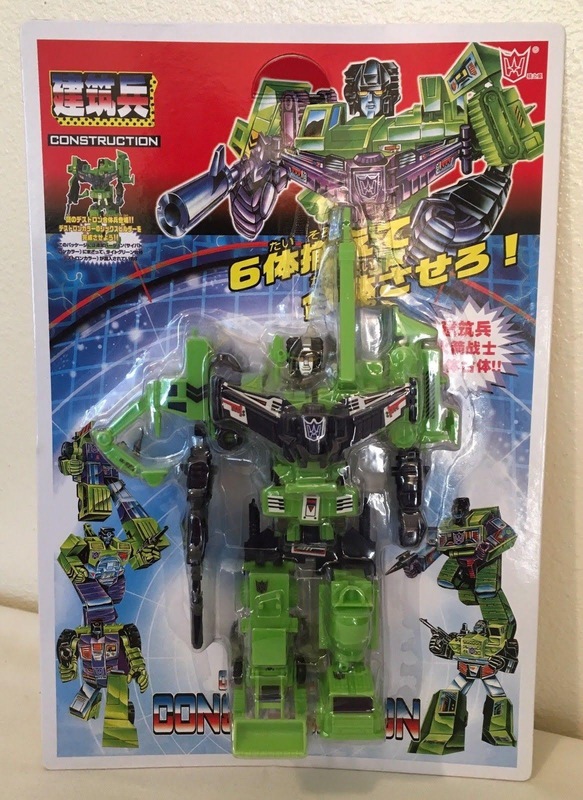 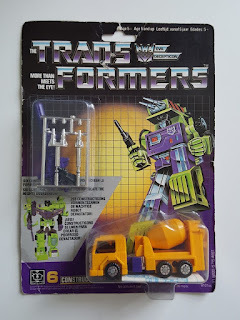 The MB Constructicons were released in Europe and have only been seen individually carded although there have been reports of the giftset also seeing a release although there is currently no photographic evidence so far. 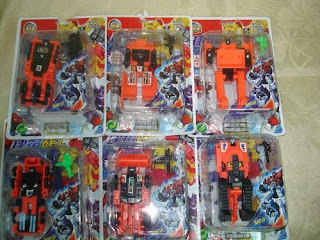 Mexican toy company IGA also released the Devastator giftset as well as the individual carded figures. 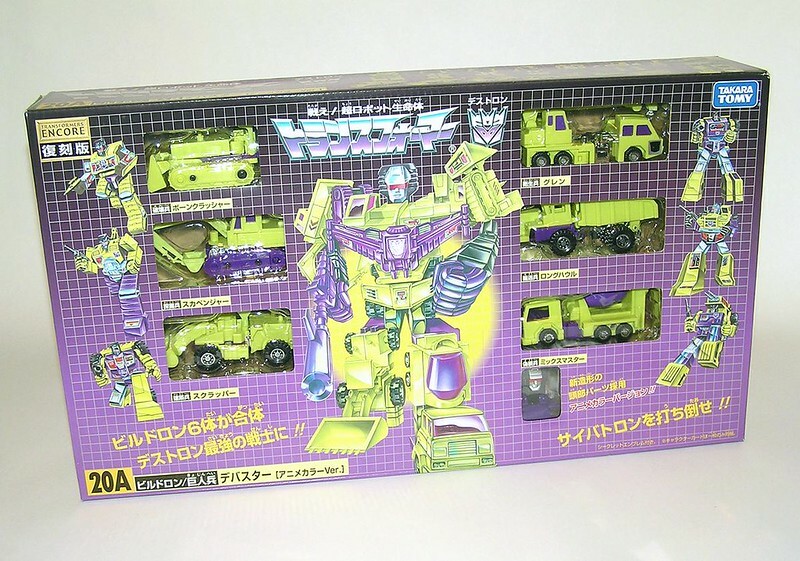 In 1986 yellow versions were made available in Europe released through French toy company Ceji, these versions were only released individually (more information here). 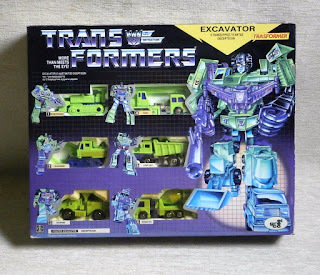 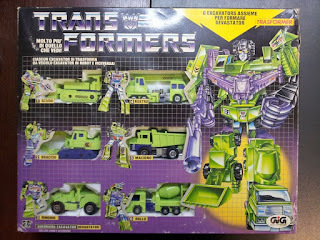 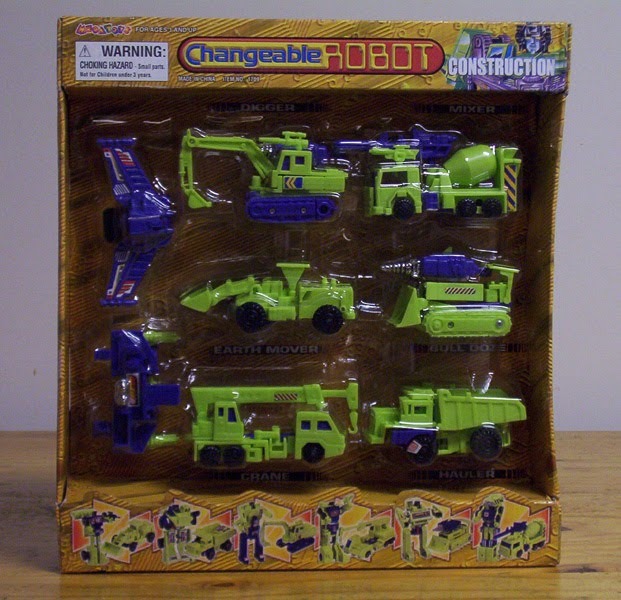 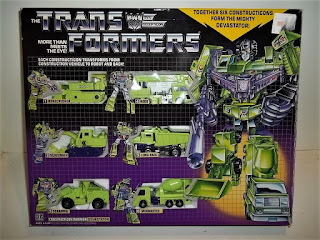 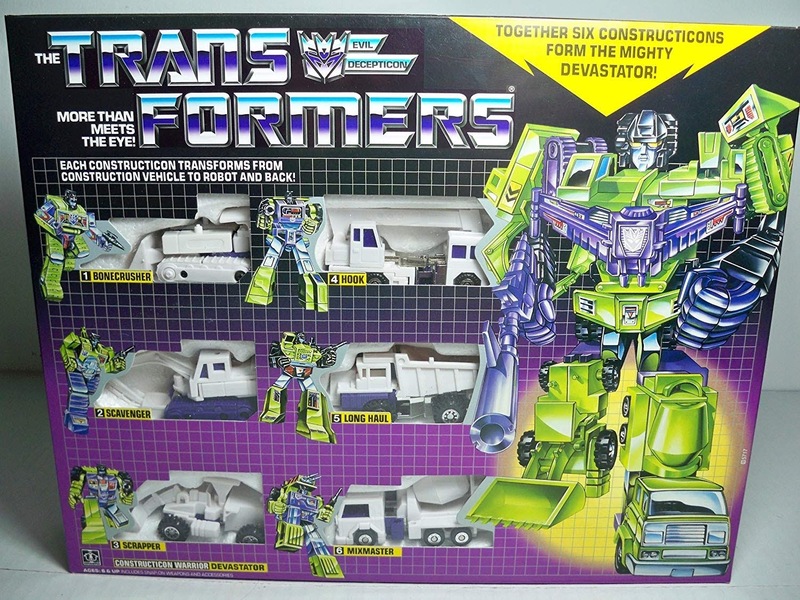 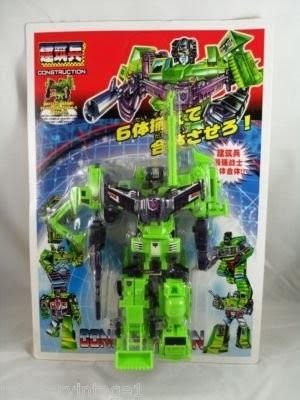 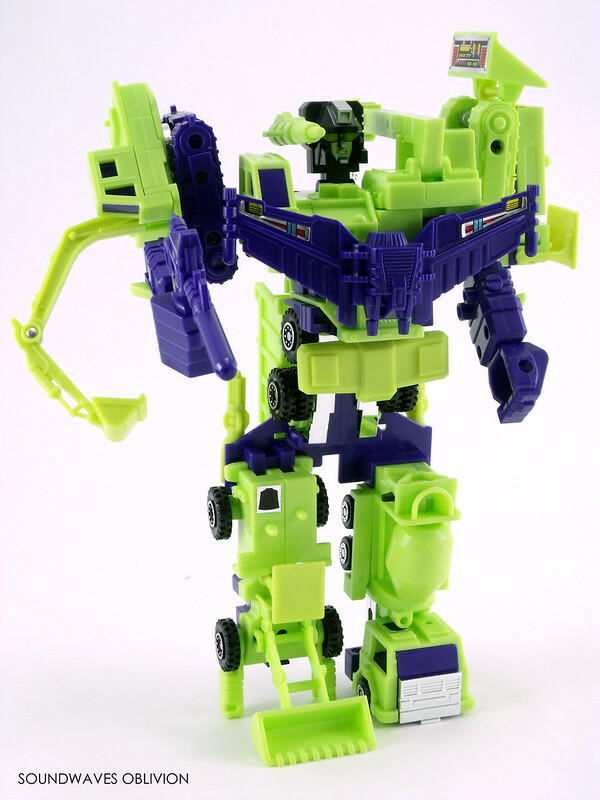 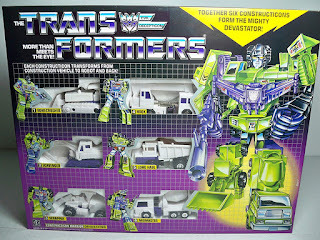 In 1992 Hasbro released individually carded Constructicons recoloured in yellow, however they did not come with the parts necessary to enable them to combine into Devastator. 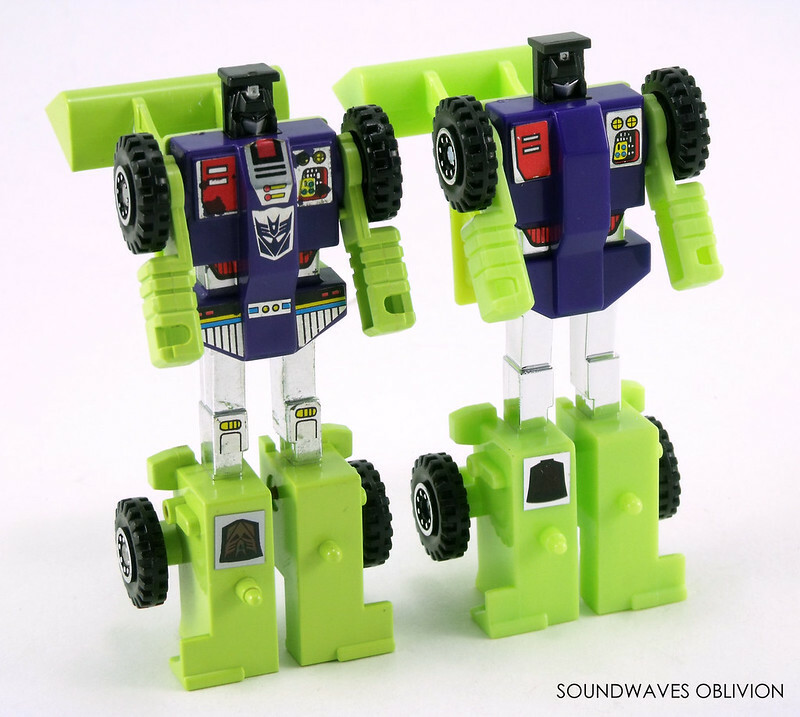 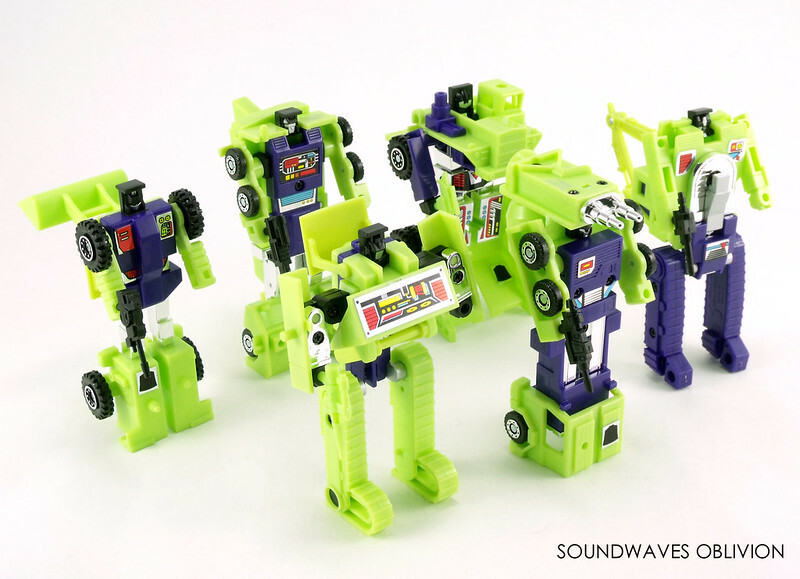 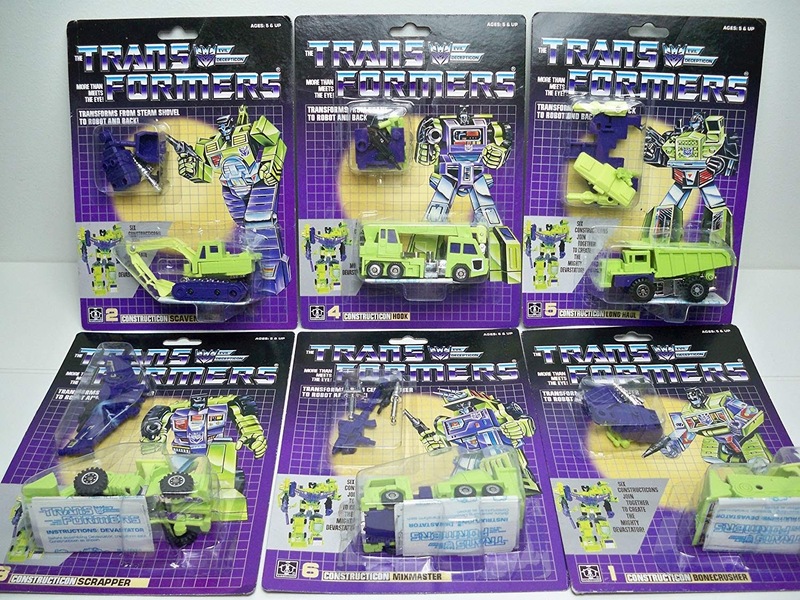 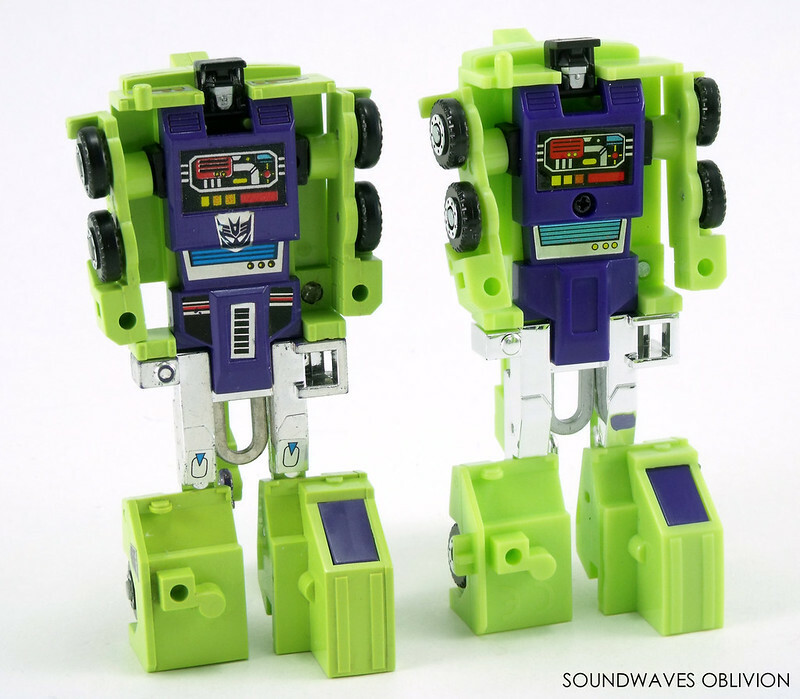 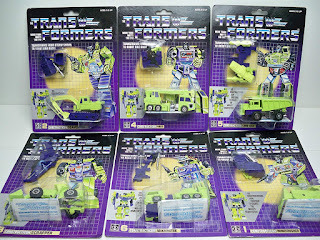 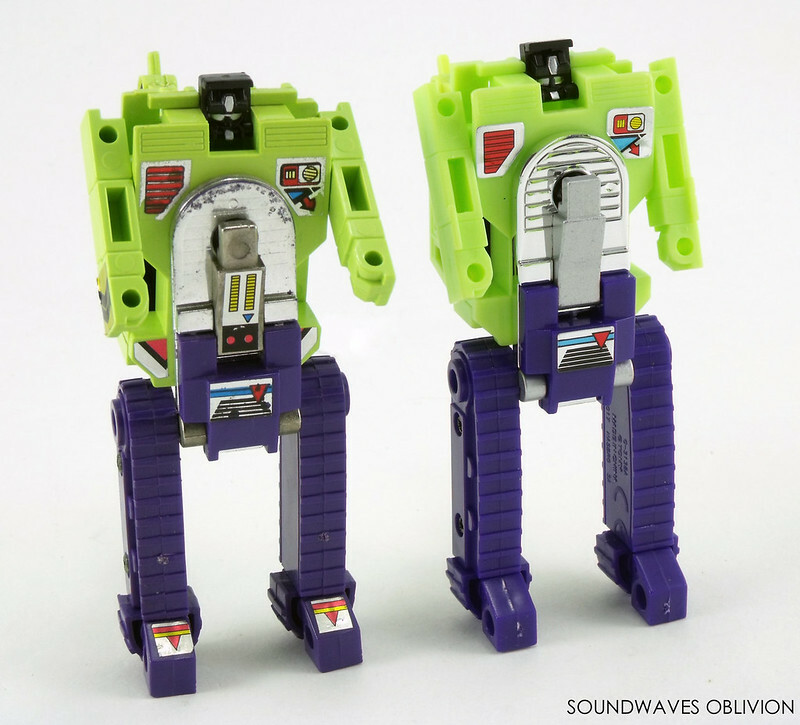 During the Generation 2 line, Hasbro reissued the individual Constructicons in yellow and they were later available in orange. 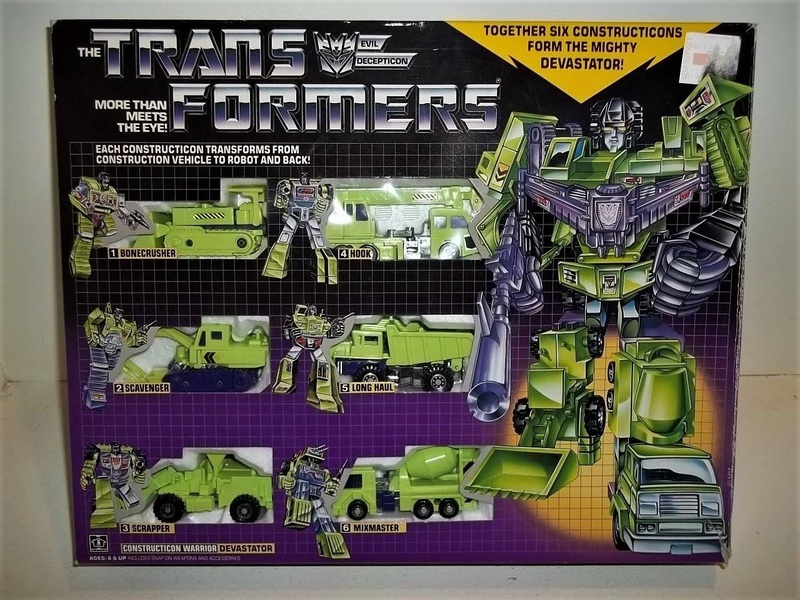 Initially it was thought the orange Constructicons were a KB Toys exclusive however they were apparently sighted in other stores as well. 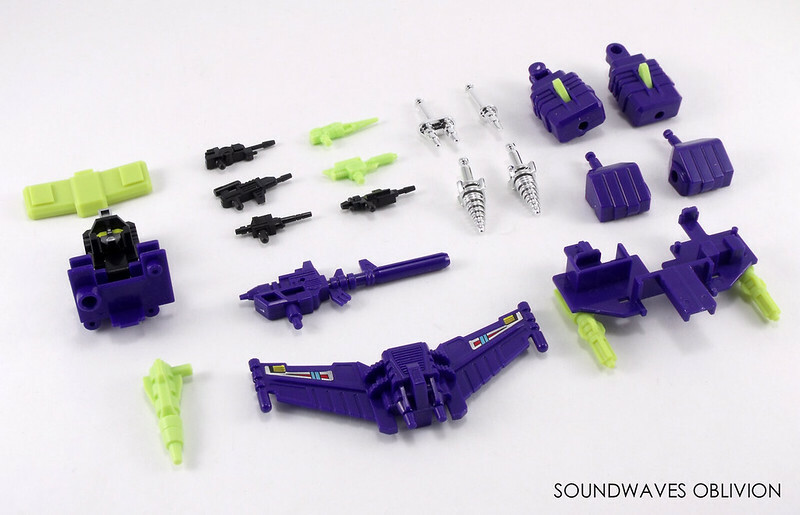 Unfortunately the spring loaded weapons were disabled. 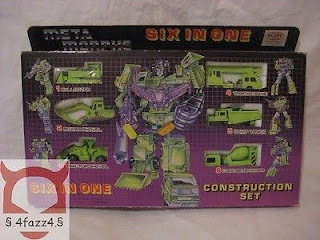 The G2 Constructicons were not released in a giftset. 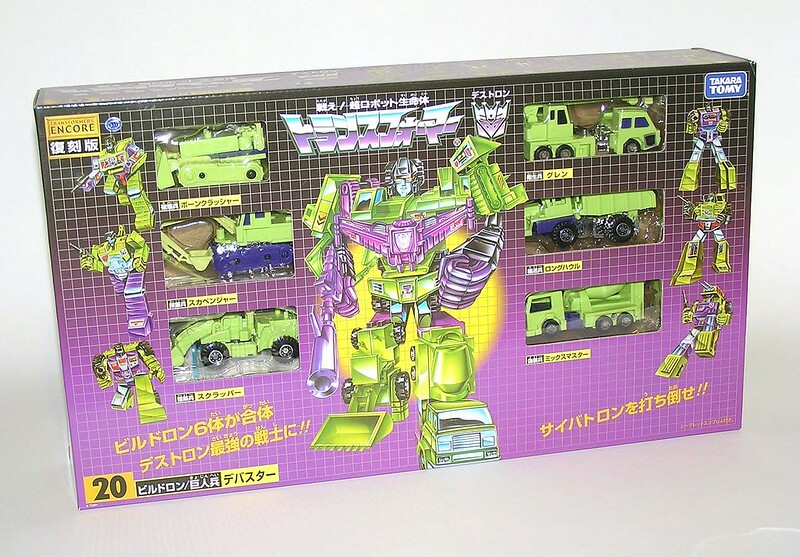 The original moulds for the Constructicons were lost so for the 2011 Encore release Takara Tomy created a new set which are very close to the originals. 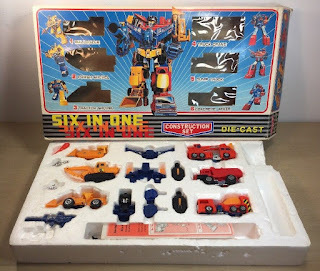 Like many Transformers the inevitable knock-offs were also released starting with the Diaclone version then onto the Transformers versions. 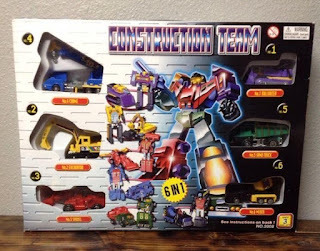 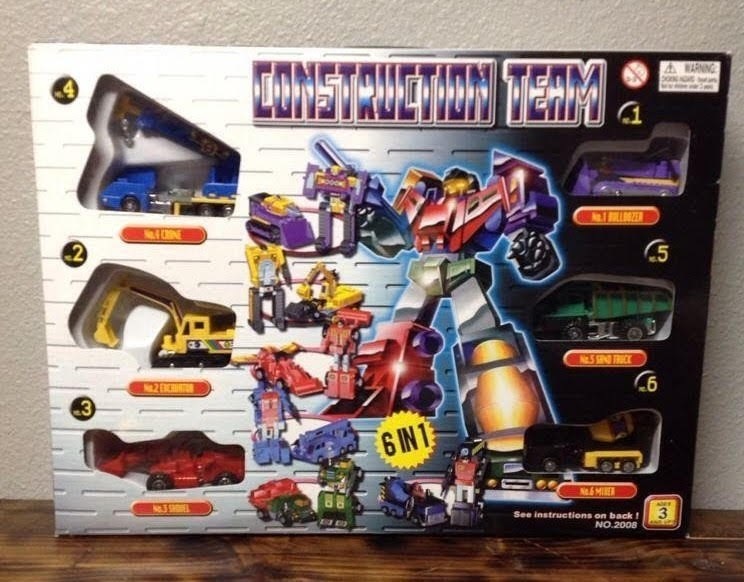 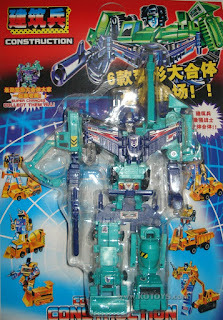 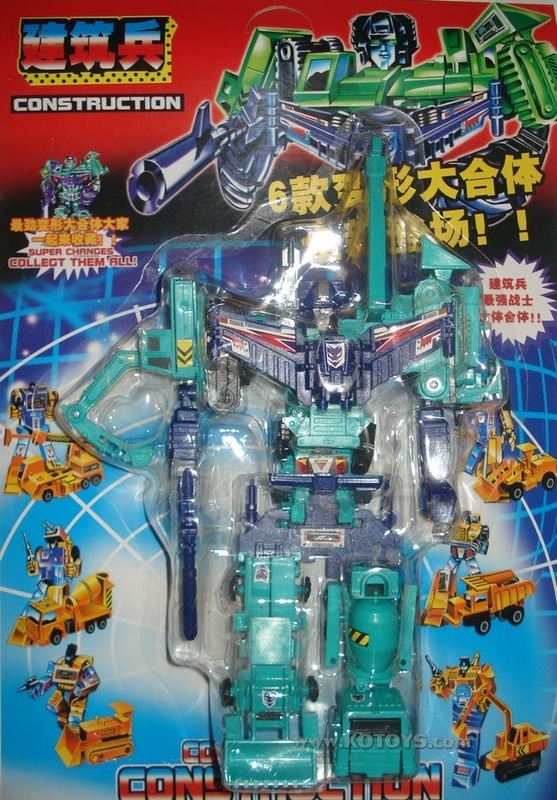 Several bootleg versions of the Transformer combiner teams were released in the early 2000's such as Devastator, Raiden, Superion, Defensor, Menasor and Baldigus. The quality of these versions are incredibly poor and were very prone to breakage. 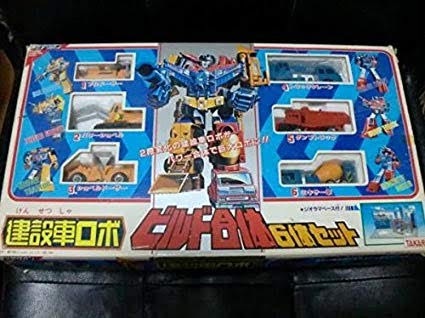 This is similar to the more prominent "Zhong Jin" knock off's however the toys themselves were of extremely poor quality. These were produced in China and apart from the colour variants, these are very hard to tell apart from the original but the quality of the toys are not as good as the originals.